Franklin Street Florist opened its doors in 1959 has served the Clarksville/Fort Campbell from that day on. Our historic location in downtown Clarksville gives us a centralized position to service all areas. In late 2013, Franklin Street Florist moved a few blocks over to a larger, nicer shop. We are now located at 211 College Street. 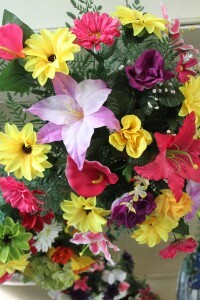 We specialize in unique, wide selection of fresh flower designs and containers. We also offer delicious fruit baskets, life-like silk arrangements, and gifts for babies, birthdays and anniversary. We stock a wide variety of green plants and seasonal outdoor plants as well. Call us today for a detailed description of our plush animals and other unique, one-of-a-kind gifts. For sympathy, you can trust in our more than 30 years of experience to provide you with just the sentiment you wish to express. We’ll deliver across the street or across the world! It doesn’t matter that you’ve lived here all your life, just moved to town, or just visiting — we’ll treat you like family! Randy Harrison was born and raised in Clarksville. He started in the floral business in 1980.